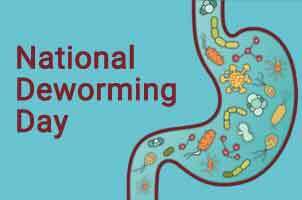 Bangalore: In order to combat the public health threat of intestinal worm infections in children aged 1-19, the Government of India will observe the second biannual National Deworming Day on 10 August 2017. A mop-up day will be held on 17 August to deworm any child who could not be dewormed on National Deworming Day. Launched in 2015, the annual round of National Deworming Day is observed nationally on 10 February, with a mop-up day on 15 February. Since 2016, the biannual round in Augustis being observed by select states based on their intestinal worm prevalence data. Deworming may have very few side effects in some children.Those with high worm infections might experience nausea, mild abdominal pain, vomiting, diarrhoea, and fatigue. In line with the guidance from the Ministry of Health and Family Welfare and World Health Organization, comprehensive adverse event protocols have been put in place.In addition to deworming, maintaining healthy and hygienic practices will help children and communities remain safe from intestinal worm infections.